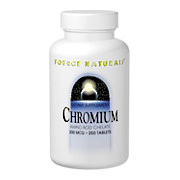 Chromium is a trace element that helps maintain normal blood sugar levels and healthy cholesterol levels. Chromium is a key constituent of the compound known as glucose tolerance factor (GTF). This mineral enhances the effectiveness of insulin, encouraging glucose to enter cells, where it can be burned for fuel. One tablet daily. Do not exceed suggested use. Chromium Chelate 200 mcg - 250 tabs, (SOURCE NATURALS) is shipped in a discrete, unmarked package. Orders are processed immediately and usually take about 3 to 5 working days to be received. We do ask that you try it for 2 to 3 weeks to feel the full effects. Any information received is used only for order processing and shipping purposes. Your information, such as e-mail address, will never be disclosed to a third party.